Prince Ariston rules over the Allegiant – an elite faction favored by the Greek Gods. Separated from his family at a young age, he became a prisoner to the rebellion. Marylyn O’Conner is a rebel, forced to do the rebellion’s bidding until an unforgiving family debt is paid. A pawn in the war for rebels to gain their freedom, she is obligated to become a spy, or her family will suffer. Driven by revenge after returning from captivity, Prince Ariston makes it his mission to hunt down rebel spies, capturing Marylyn O’Conner in the process. Desperate, Marylyn knows she needs to escape her alluring captor, or risk the safety of her family. My Review: For some unknown reason this book reminded me of Cinder(the Lunar Chronicles). The story is by no chance similar but my feelings towards both books were. Why? Because the characters were likeable, straightforward. There was no clutter in this book which I appreciated as a reader, and writer. Everything flowed, no loop holes, no mindless yammering. A romance, but not only a romance. And it ended well yet left avenues open for the sequels. Overall, I would recommend if you like YA Dystopian or Fantasy, Action & Adventure. Synopsis: Lily Jordan has just found out that she is pregnant for a famous golfer who ditched her. With the recent demise of her parents and the debt they left behind, Lily and her two brothers has to come up with a plan to save their family business, a tree nursery and skating rink. In comes Noah to save the day by offering to buy a percentage of the Jordans’ business but Lily isn’t too keen on losing her family business, or heart so quickly. My Review: Rated 5 stars in Goodreads because this book was a warm and enjoyable read to kick start my holidays reads. A very short book, actually a novella that can be finished in just a few hours but it’s content is full of feeling and substance. Great writing too. I completely recommended this to any who enjoys clean Hallmark type Romance as much as I do. 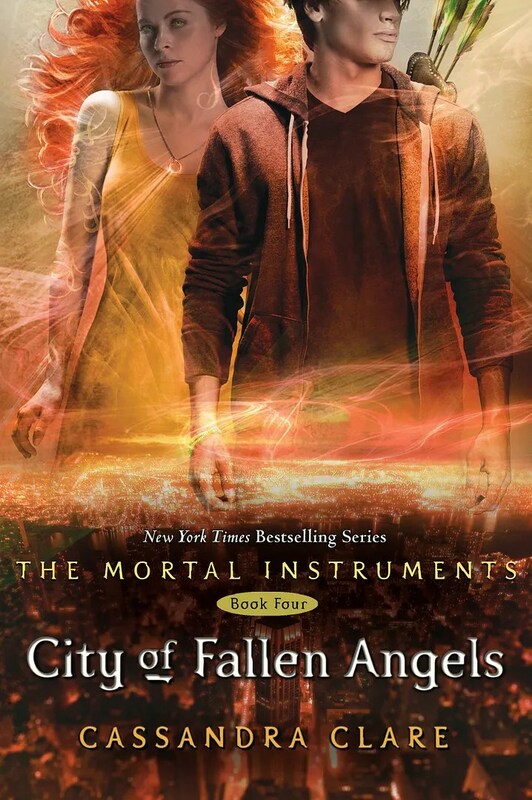 City of Fallen Angels is the fourth installment of The Mortal Instruments Series. Needless to say, it wasn’t a page turner like the first three books. For me, at least. I did enjoy it however, because it’s a continuous piece of a larger story. I’m not really big on YA per se but I will read it if it sounds interesting. The adolescent nature of the characters really showed in this book, something I didn’t care for but it is YA fantasy so I’m not beating up the book about it. I enjoyed that there were several points of view rather than just Clary and Jace, especially Simon. The book is somewhat revolved around the importance of Simon being a daylighter and what his blood can do. There’s also the case of Jace who is having nightmares about himself hurting Clary, the one person he loves and can’t live without. We get to see more of Isabelle, Maia’s story as well as a blast from Magnus’ past. The overall plot of the book is okay in my opinion and I did rate the book three stars on Goodreads but I would recommend that it be read in order to complete the entire series as well as read Cassandra Clare’s other series. I believe the Mortal Instruments pave the way for other characters we may see in other books. I think we may also see pieces of this book in the TV Series. Are you a fan of the show as well? Leave me a comment to let me know what you thought about City of Fallen Angels. I’ve been lucky this year to have found some well written romance novels. A lot of romances can get cliched and cringey, not any fault of the authors but I believe few of us writers really know how to capture the essence of true love, especially true first love. Well A.D. had no issues doing that. Love and heartache roll off every page in this book. It was beautifully written, and felt and what I loved the most or actually admire, is the author’s ability to keep love alive throughout the book without repeating herself. As a writer, I find this very difficult. I get very repetive once I’ve fleshed out my characters enough so I pretty much fell in love with the way this book was written. Julianna has just returned to her hometown after being separated from her cheating husband. She has negative, and sometimes troubled feelings about returning to Tennessee. Soon after moving back, she meets up with Eric, her best friend in high school. As the book progresses we learn that Julianna and Eric both had a deep love for each other but never acted on it due to circumstances. They’d also broken contact for some time so it took them a few to rekindle their friendship, and admit their love for each other. There’s some suspense elements in this book and if you’ve read my blog before you’ll see that’s my favorite recipe for romances. I’ve always seen book reviews online, on Youtube, on blogs but recently I’ve been subscribing to more of them on Youtube. Little did I know there’s an entire community online called Booktube. At first I thought it brilliant, as I myself love to share reviews and talk about books. Most of my spare time is spent writing or reading books so finding Booktube was amazing to me until I realized that the same books were being talked about over and over and over until it lost its appeal. Most of these books were also in the YA category. Now don’t get me wrong, from time to time I enjoy a good YA novel, like most recently History Is All You Left Me by Adam Silvera. And some of my favorite books are YA, such as, The Fault in Our Stars by John Green. I also enjoyed series such as The Lunar Chronicles by Marissa Meyer and The Mortal Instruments by Cassandra Clare. But most books that are hyped aren’t always worth the hype. I couldn’t get past a few pages in a lot of YA books. Not that they were bad, but because I am no longer a young adult and I enjoy reading a wider range of content. Come to think of it, I’ve always enjoyed books with older characters like those of Dan Brown, Steve Berry, Nora Roberts, Jodi Picoult, just to name a few. I also like darker content, for example Anne Rice or V.C. Andrews and of course the man himself, Stephen King. I read these novels quite early on so I connect with these type of stories better. So while I do think that Booktube is amazing and I love it, there is lack of diversity in its genres. It’s largely because there is an abundance of young people making videos on Booktube. Another factor to consider is the marketing part of it where publishing companies send out copies for them to review. Which I have no problem with at all. But I’d like to see some older characters being talked about in crime fiction, historical fiction, action and adventure, romances etc. I’ve been heavily considering making videos to share my world of reading and thoughts but since I’ve discovered Booktube, I feel like I wouldn’t fit the bill. Maybe I will, at some point in time because I know there are tons of people who read the same books that I do. What genres do you read? Leave me a comment, I’d love to hear. May TBR List…books books books whoooo! Good Friday folks! It’s a beautiful day out but I am inside tidying the explosion my tiny humans make ten times daily. How was your week? How is your Friday going so far and what are your plans like this weekend? Most Importantly….what are you reading???? Note: I don’t complete my entire TBR list each month(womp womp womp) but I do get two or three of it crossed off. I’m always hauling books so I’m not going to unrealistically set a goal of twenty books. I’ll share a few that I’m hoping I will get into before the end of May. By the way, have you readers set reading challenges for the year? I’ve set a fifty book challenge and I am down thirteen so far(not very good) but we’ll see. No pressure! I do like to mix up my reading as I read everything from romance to horror to fantasy etc etc and most recently I’ve been feeling the need to revisit a few classics as well as integrate children’s literature into my reading. R.L. Stine – I do want to read a few R.L Stine books in the Fear Street City really soon but I’m not sure which ones yet. As an avid reader of Kindle Books, I always leave honest reviews whether they’re good or bad. If you do this, you’ll find that quite often you find an e-mail or two in your inbox requesting you to read a book in exchange for a review. Now I have no problems with this marketing tactic. Self published authors need to get their books out there, don’t they? So it’s not in the least bit annoying to me. I’m actually excited to receive free material to read. Having a variety of options is crucial for me, because I read different genres based on the mood that I’m in. What irks me is when you get this long e-mail detailing the book and it’s genre and how your reviews on Amazon made them select you to read their book, and then it’s not free. The author will give you the impression that they’re sending you a free copy of their book and then you see a link provided, thinking….uh…well okay, maybe it’s a promotion day and it’s free so let’s click this link. Then you click the link and realize that the book is not free or on sale, and you have to purchase a book that probably won’t even be your first choice, and read it, and review it, because the author asked you to. Now I have some issues with this strategy. And one other thing that I got hit with in the past is being offered a code to get the book free and it didn’t work. I have self-published a couple books with amazon kindle and I ran promotions. I’ve since taken down a few for revision, and I’ve never asked anyone to read my book via email because I myself didn’t think it was that good. But that’s not the point. The point is, as a self published author, who doesn’t have a name in the writing world and very much avenues of promoting my book in a way that people will rush to buy, I understood that I needed to give away a lot of my work. The best way to gain exposure is to literally give your work away. This is just something that happens when’re you’re self published and not picked up by an agency. It’s part of the game. WARNING: Although my reviews may not contain adult content, these books are do. Book reviews also contain spoilers, read at your discretion. Dark Desires. (Historical Romance) Darcie Finch is a betrayed and unfortunate girl who gets sent to Dr. Damien Cole for help by her prostitute sister. She get’s hired as a maid but eventually is hired for her artistic skills in which she helps Dr. Cole dissect dead bodies. Darcie grows suspicious that Dr. Cole is obtaining the dead bodies illegally yet she desires him to no end, and he her. Dark Prince. (Historical Romance) Aidan Warrick, a pirate and smuggler goes to collect his due from Jane Heatherington’s father. He winds up taking Jane, a cripple to work for him for free for seven years to pay off her father’s debt. It’s a story of hate and revenge and passion. Jane learns that her father is not the man she always thought he was as he betrays his own daughter. She also learns that he may have some history with Aidan Warrick, and that Aidan Warrick may not be the dark and dangerous man she initially thought him to be. Priest: A Love Story by Sierra Simone. A very enthralling story about forbidden love. The writing was phenomenal and I loved how it was told from only the Priest’s point of view. Father Bell is a twenty-nine year old priest, taken his vow of celibacy after a tragedy in his family. One day Poppy enters his confessional and one thing led to another. I’m sure you get the idea but this one wasn’t cringe worthy. After the Storm by Claudy Conn. A well written easy read. Some friendship, some lust, some suspense, some betrayal. The Earl of Danfield proposes a marriage of convenience to Jenny, who accepts as she herself can see it working out for her as well. A little bit of chaos here and there with the people that surround them but the book wraps up well and I loved how the story wasn’t rushed. Both characters had a gradual way of falling in love. Collison (Portland Street King 1) by Evie Harper. I’ve read this this last September so I barely remember the details but I’m sure it’s a good one. Fourteen year old Slater escapes his abusive foster home with his foster siblings and they survive on the streets. Years later, he runs into Piper a social worker whom he is both intrigued and disgusted by because she works for a system he no longer believes in. The brothers are in a turf war/gang thing but it get wrapped up neatly and prepares for the second installment of the series which I have not read. I have read a vast number of these short steam stories but I can’t review all in one sitting, unfortunately. The month isn’t over yet, still a week to go but with all that is going on, I don’t think I will get to complete another book before 2015 is upon us. Unfortunately this month was really hectic and though I had a number of books lined up to read, I only completed one. I must say it is a really good book. I have moments where I like certain genres and I am absolutely in love with Christmas romances. Without giving away too much, it is a Christmas romance novel, set in England in the 1800s equipped with passion and humour to make one’s soul smile. I enjoyed all aspects of the book. The characters were well written and I loved the way they were portrayed, be it in a negative or positive role. Even the ones that’s suppose to annoy you, will grow on you. What amazed me most is the little humour that some characters bring, I found myself chuckling from ear to ear. It’s rare for a book to do that to me. It’s not that writers don’t write comedy well, I am just a tough cookie. At the end of the book, I was satisfied with the story, the climax, the characters….I literally fell in love with the main male character hehehe. All are available on amazon.com for Amazon Kindle!